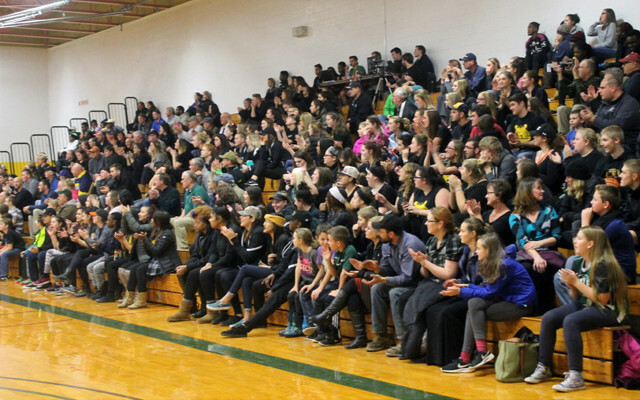 More than 200 fans packed the UMFK Sports Center on Monday night for the Bengals’ 2016-17 season home opener, where the UMFK men emerged victorious 68-63 over the UMPI Owls. FORT KENT, Maine — More than 200 fans packed the University of Maine at Fort Kent Sports Center on Monday night, Nov. 28, for the Bengals’ 2016-17 season home opener, and they were rewarded with an exciting and aggressive game of basketball in which the UMFK men emerged victorious 68-63 over the University of Maine at Presque Isle Owls. “UMPI started the game strong and caught the Bengals on their back feet as they got off to a 15-7 start. UMFK’s Travis Harlin scored 21 points in the first half to keep the Bengals close, otherwise the margin might have been much greater. UMPI hit six threes in the first half and trailed by just one, 35-34,” according to a press release issued by Bengals Coach Tom Bird. Top scorers for the Bengals were Harlin, who finished with 29 points and Joe McCloskey, who added 13 points and seven rebounds. Kevin Collins led UMPI with 18 points, Kim Collins had 16 points, and Harris finished with 11 points. The win over the Owls brings the Bengals’ record to 7-2, the best start the team has known since prior to the 2003 season. Bird said he hopes to coach the team to a USCAA tournament appearance. Along with Bird as head coach, assistant coach for the Bengals is Fletcher Brown. Kyle Fisher serves as the team’s athletic trainer. The head coach of the Owls is Mike Holmes. Assistant coaches include Elijah Rivera and Jesse Dixon. 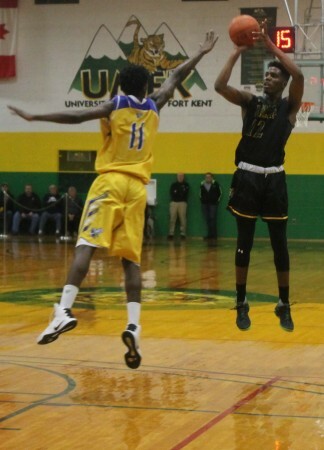 The Bengal men will next take on The University of Maine at Machias on Wednesday, Nov. 30, at Machias. The Bengals will play four more home games this season, with their next home match up against Alfred State on Jan. 6 at 1 p.m. at the UMFK Sports Center.